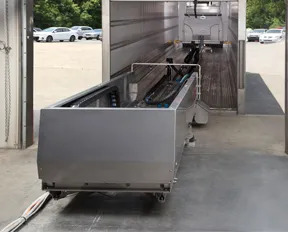 Istobal has launched HW’Intrawash in the US market, a fleet cleaning and sanitizing system for trailer and box container interiors. The solution dramatically decreases cleaning time as well as water and chemical usage by utilizing high-pressure pumping to deliver 33 gpm at 1100 psi and a highly accurate chemical dosing system in line with concentration, quantity, and reaction time requirements for each transport fleet. The easy-to-install system can clean a 53’ trailer in as little as three minutes, and clean and sanitize in six minutes. Compared to a manual wash process, the machine cleans 75 percent faster and with a better control of chemical products.